The Steam Workshop is a feature of the Steam Community that's designed to facilitate game modding. Most Steam games that support the Workshop allow you to either download and install mods and other items with the click of a button, and others use the Workshop to crowdsource content that eventually ends up in the game in an official capacity. How Does the Steam Workshop Work? The Steam Workshop is a mod repository for Steam Games. When a developer releases a game on Steam, and that game has mod support, they have the option to tie it into the Steam Workshop. 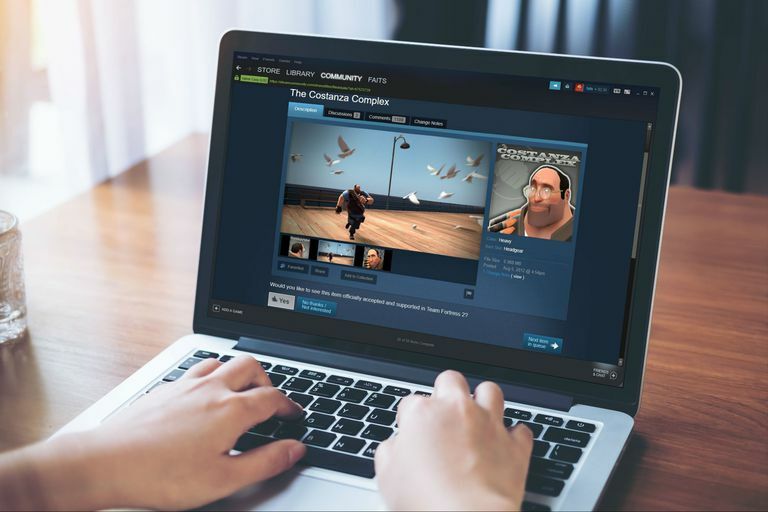 Linking to the Steam Workshop allows content creators to upload their mods and other items for a massive audience, and it provides regular players with a straightforward and streamlined process for obtaining mods. When you open the Steam Workshop, which is accessible through the Steam Community, it presents you with a list of popular games that have mods available in the system. You can also choose to check out featured games, most recently updated games, view an alphabetical list of every game that supports the feature, or one that places the games you play the most at the top. You can also access the Steam Workshop directly from your Steam library. When you click on a game in your library, and that game includes Steam Workshop support, you'll find a convenient button that links directly to that game's Steam Workshop page. Is the Steam Workshop Free? The Steam Workshop is free to use, and most of the mods and other items that you'll find in it are also free. Some games, like Skyrim, also include premium mods that you have to purchase. When you buy one of these mods, a share of your payment goes straight to the person who created the mod. If you pay for a mod in the Steam Workshop, and it doesn't work as advertised, or you aren't satisfied with your purchase, you can return it through a similar refund policy to the one that governs Steam game returns. Most games that support the Steam Workshop use an implementation that allows you to download user created content, like models, plugins, and mods, that are designed to alter and improve your gameplay experience. It works a lot like modding other games, but the process is streamlined. If a game supports this use of Steam Workshop, all you have to do is locate something in the Steam Workshop that you're interested in, subscribe to it, and Steam handles everything else behind the scenes. The only potential source of confusion is the subscription terminology. Instead of downloading or installing items from the Steam Workshop, you subscribe to them. If you no longer want that item or mod in your game, you unsubscribe, and Steam removes it. Before you download and install any items from the Steam Workshop, make sure to back up your game files. If you don't back your files up, and something from the Steam Workshop causes problems or corrupts your save data, you'll have to start over from scratch. Launch Steam, open your Library and click a game that supports Steam Workshop. Scroll down to the Workshop section, and click Browse the Workshop. If you don't see a Browse the Workshop button, that means the game doesn't support the Steam Workshop, and you'll have to try a different game. Every game that supports Steam Workshop has a Steam Workshop page. This page provides you with a variety of ways to discover new models, plugins, mods, and more. Click any item on the main page that interests you or use the search function or one of the other sorting options. When you find an item that interests you, click it. When you click an item in the Steam Workshop, it brings up additional information about that item. If you want to try it out yourself, click + Subscribe. If you want to remove the item, plugin, or mod from your game, return to the same page and click the Subscribed button again. Launch your game, and try out your new item or mod. You can download multiple items, plugins, and mods at the same time, but some Steam Workshop items can create conflicts with others. If your game doesn't work correctly after installing several things from the Steam Workshop, try removing them one at a time until the game starts working again. Instead of allowing you to download and install any Steam Workshop item you want through the subscription system, some games take a different approach. These games allow you to vote on user-submitted items in the Steam Workshop, and the most popular ones get officially incorporated into the game. Open your Steam Library, and click a game that supports this implementation of the Steam Workshop. Scroll down, and click Browse the Workshop. If you don't see an option to browse the Workshop, the game doesn't support Steam Workshop. If you want to discover brand new items to vote on, click the large Click to get started voting in your Queue button. If you want to vote on a specific item, try searching for it with the search box on this page. If you want to see an item show up in the game officially, click Yes. Click Next item in queue, and repeat the voting process for the remaining ones. You can also click any item in the Steam Workshop to vote on it directly. Click Yes if you want to see the item appear in the game. You can vote for as many, or as few, items as you like. Make sure to share your favorites with friends. When a Steam Workshop submission receives enough votes, the developer of the game may decide to include it in the game as an official item. Can Anyone Upload to the Steam Workshop? The Steam Workshop is available to everyone. There are no barriers to entry, other than your skill and imagination, although submitting items does bind you to an agreement with Valve. Uploading to the Steam Workshop is more complicated than downloading mods, and you don't do it through the Steam client. Every single game that has Steam Workshop support has a separate method for uploading. Some games have a menu option within the game that allows you to upload your mods to the Steam Workshop, and others require you to enter a command line code. Some publishers also provide a utility that's designed to upload mods for their games to the Steam Workshop. If you're interested in uploading to the Steam Workshop, check your game to see if it has an option to do so. If it doesn't, contact the developer or publisher of the game for specific instructions.